Let me begin by saying that nobody owes anybody a free tool, and that schools aren’t always the best customers. Money is always tight and anyway the teachers don’t have their hands on the credit card; that’s down in the Bursar’s office because we’re happy to trust our children with you, but not our credit card! Anyway, the NING experience is a salutary one. We had a good little NING network going (NING allowed you to create a mini-social network of your own) It was the Breakfast Group and consisted of a group of teachers from various schools who met twice a term to talk about effective teaching and learning. The NING was good.27 teachers all good and true. We could have groups, messages, post pictures, send out agendas and answer questions. A bit like Facebook for grown-ups. It was working. 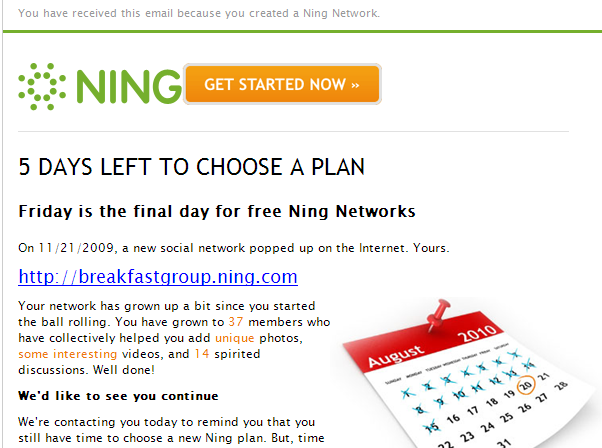 First NING announced they were changing their ‘business model’ and no longer offering free accounts. Please select a plan, they said. There was much outpouring of angst and much gnashing of teeth from groups who’d set up sometimes very large networks. Educators pleaded. Can you give us a free ride? I think NING agreed, but only for US based groups. The rest of the world would have to pay their way. Which we tried to do. Ever tried to work out how to send a cheque to a website in America? They’re not used to dealing in paper facsimiles of cash, and schools don’t like giving credit card details to funnily named fly by night web 2.0 entrepreneurs. So we were stuck. We did eventually manage to find a physical location owe could send a check, and find a well hidden page in the Ning website that explained that, and persuaded the powers-that-be at school to write and cheque, and post it. Except that, as the weeks went by, NING kept warning us that time was running out, and I kept emailing them saying ‘we paid already!! !’ Repeat. Repeat. Until they closed it down, never cashed the cheque and never responded. The moral of my tale? You can’t trust the cloud! They blow away. And you can’t build a professional network on free tools and promises from a zany young web-guru from San Francisco. Attractive and shiny as those tools are. And here ends the sermon. Oh,oh!!! I know time is running out. Can’t you please cash our cheque? I’ve commented on Twitter about a couple of these things but I thought it worth detailing here some web 2.0 tools that I’ve been impressed with lately and that have become party of my daily work on the web. 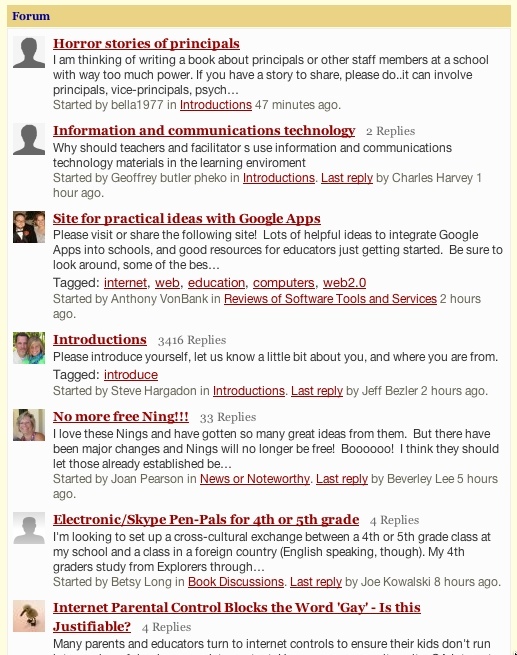 Ning is a tool for you to create your own social network. I didn’t get it at first. I thought: what for? Do I really want to compete with Facebook? I envisaged maybe using it as a site to connect the extended family. I tried once to set up a multi-user blog on WordPress for the family and half of them failed the login test! So I turned to myfamily as an easier alternative. But recently I started using NING in a couple of different contexts; a group of like-minded cyclists first up, then in a network of learning technology teachers. It began to make sense. Forums, multiple blogs, pictures, videos, even chat. 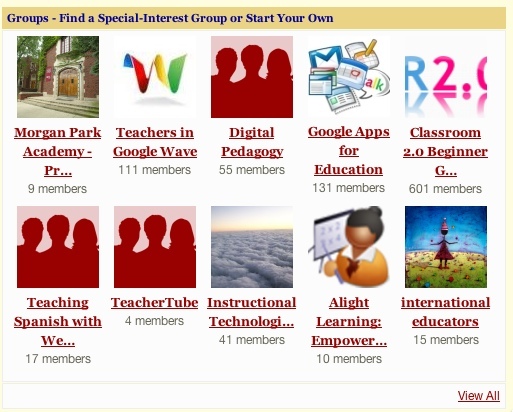 You can set up a network in a few minutes, and teachers are beginning to use it with their students. Ning was started with a simple premise: when people have the freedom to create a new social experience online, uniquely customized for the most important people and interests in their lives with no effort, no cost, and infinite choice, the world is a better, more colorful and certainly more interesting place in which to live. By providing people with a better way to discover and stay connected to the most important people and interests in their life, Ning represents a new chapter in how people create, organize, and communicate online. 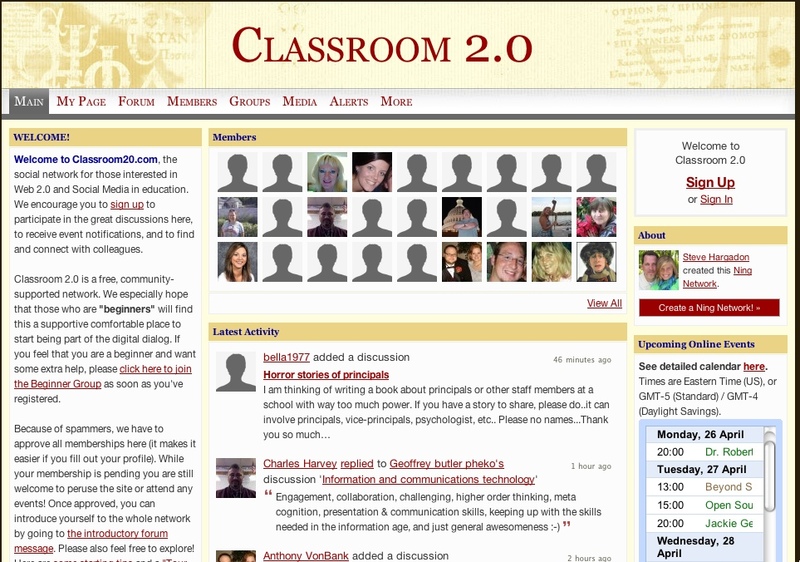 Tonight I joined Classroom 2.0 Ning, ‘the social network for those interested in Web 2.0 and collaborative technologies in education.’ I thought I’d give them support and join in; then realised they have 24,000 members in that network already! Okay, maybe I was wrong about Ning. Okay, I know that Safari and Chrome do something like this by default, but it’s only the sites you most often visit, not necessarily the ones you want to keep in your head. And what about the tabs you can create with pages on things that interest you? Note below I’ve got tabs on cycling, shopping, tek, curriculum etc. To be honest, I tried this out thinking it would last about a week. But it’s been over a month now and I’m still using it. A long while ago now I created my own start.htm page using Dreamweaver, based on the simple Craigslist template. A couple of colleagues along the way have asked how I did it and wanted one themselves, but couldn’t be bothered with the html. I can now show them this. Over the last few weeks I’ve had the need to create some screencasts and went out looking for the best tools. One of the wikis I’ve been working on has as its audience member of the public often with very low tech skills. 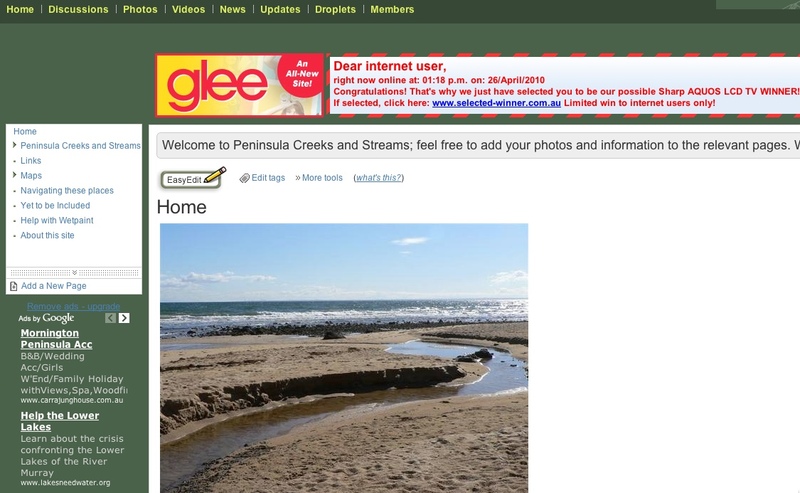 I needed to SHOW some users how to edit a page, insert an image, link to other pages. Jing is a great solution. A free tool that allows you to create screen shots or screencasts up to five minutes long. It works beautifully, has a pro version if you want more features, and links to Camtasia if you really want to get into editing it all. But, as a simple tool for capturing screenshots or movies, it’s hard to beat. I would talk about Feedly too, a Firefox extension that works with Google Reader to create a magzine like start page, but I’m not qualified. I just started looking at it today. I love it already, and will talk about that some other time.